It is impossble to complete a trip to the the north of Vietnam without a visit to the absolutely amazing Halong Bay region. 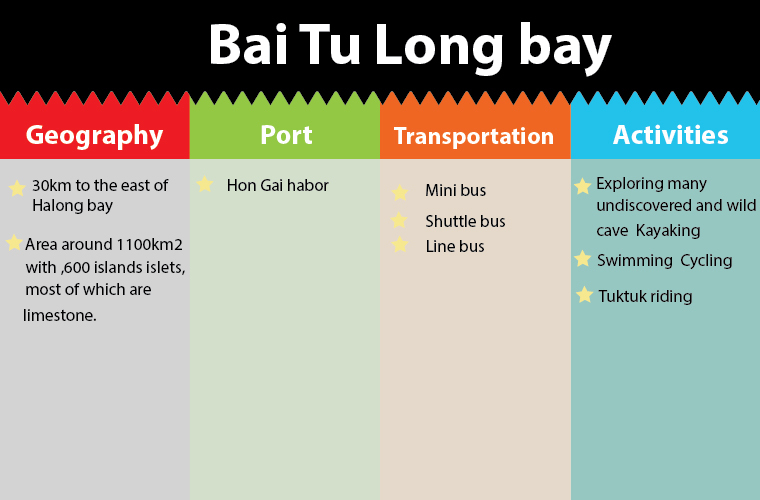 Nevertheless, it’s not that simple since the region actually includes 3 bays Bai Tu Long, Lan Ha and Halong Bay are all beautiful and worth your visit. 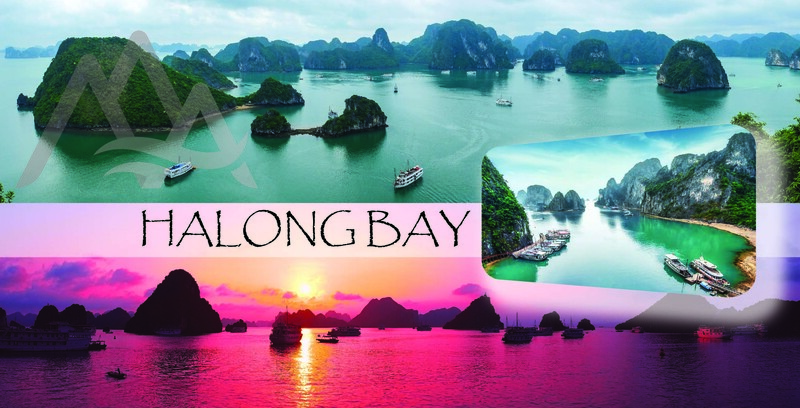 This article will provide you all the information you need to decide which place is the one for your next visit, and how to decide between Halong Bay, Bai Tu Long Bay or Halong Bay. 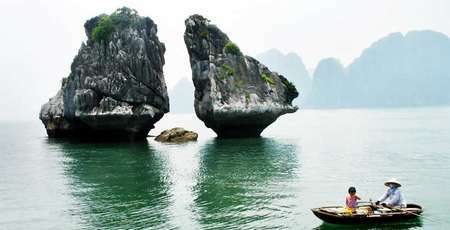 Halong Bay is the most well-known place to worldwide tourist, who are hunger for the natural and hidden beauty. Lan Ha Bay and Bai Tu Long Bay have the same scenic beauty as Halong Bay. The best choice is to experience the three bays during your trip to Vietnam. Nevertheless, what if you haven’t got enough time to scolling through three bay? Then in this case, which bay should you choose? The amount of touirsts to this place has increased significantly recently. In fact, services including entertainment, restaurants and accommodation have also risen to satisfy the needs. In recent years, Halong City and the bay have become busier than ever. If you’re an extrovert, a solo traveler or a group of friends, Halong is the one for you. Spending your time on busy but beautiful beaches like Titop Island Beach, Three Peach Beach and Tuan Chau beach with a couple cans of beer would be a great choice. You can find these both on land and on special cruise boats. A night out on board would be absolutely great with a wide range of beers, wines, soft drink and cocktails served on these cruises. Barbecue buffets, deluxe seafood buffets and many other dishes of 4-star Michelin restaurant quality are available. Tuan Chau theme park, Vinpearl Land Halong and other theme parks are a really outstanding choice at night. The famous show here is the high tech water fountain with music, laser lighting and film projection on water screens at Tuan Chau theme park. 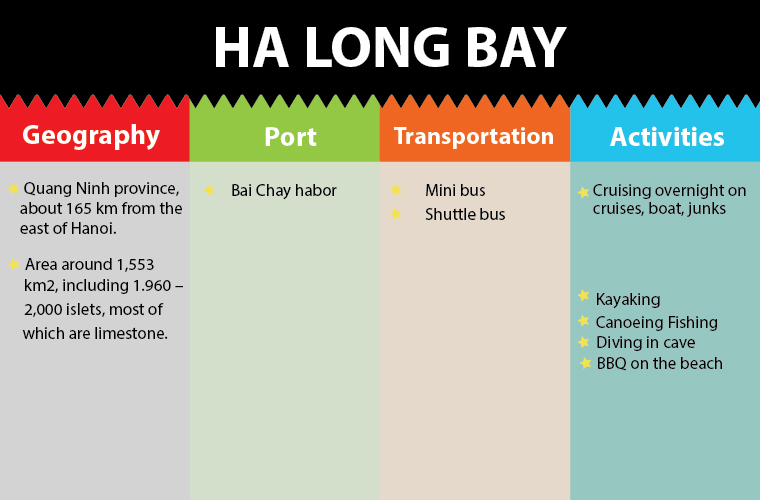 The whole bay area takes three quarters of Halong bay, a small number of tourists have acknowledgement about this place. However, the bay shows the most stunning seenery in comparision with two others. This is the reason why Bai Tu Long bay have a reputation as one of the top off the beaten track destinations in Northern region of Vietnam. If you are not a fan of the crowds and seek for the tranquility instead, Bai Tu Long bay is far more the best choice for you during your trip to Vietnam. In case you are a fan of adventure, who seeks for a place haven’t been spoiled by mass tourism. 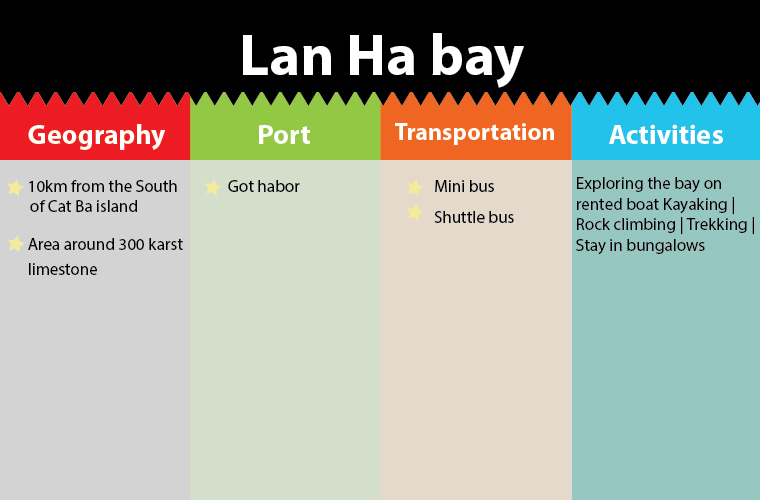 Lan Ha is the right place for you since not many foreigners are aware that the limestone’s karsts and islands go beyond the actual “Ha Long bay park”. Lan Ha is beautiful when you can rent a cruise boat to explore the bay by yourself. It could not be deniable that this is great experience for those people who are self-confident and and look for whole new kind of adventure.